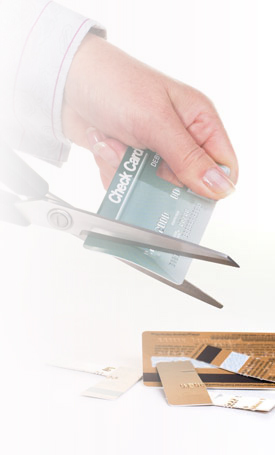 Credit Card Blog - Does My Credit Card Expire On The First Or Last Day Of The Month? Sometimes time flies by, and important dates may pass us. Important dates like credit card expiration dates! We have all had it happen to us; noticing the expiration month is upon us and we forgot to order a new card. How much time do you have? When does the credit card officially expire? Donâ€™t worry if you forget to get a new card right away. You actually have until the end of the month to use the card. But when that month is up, you better have that new card. Usually, the card will expire 4 years to the month that you got it. So, you have plenty of time to plan ahead and get a new card! Ok, I knowâ€¦that is easier than it sounds. It would be easy for me to sit here and tell you to pay attention, even though it has happened to me as well. Unfortunately there are not a lot of tips out there on what you can do while waiting for a new card. If you know your card will not come in time, then make sure you have enough cash for the few days you will be waiting for your new card. You will not need much, just enough to keep you a float for a few days. Also, make sure you plan ahead so that you will not need to make any large purchases with your card the closer you get to the expiration date. The wait may seem like a long time, but itâ€™s ok. The inability to spend money for a few days may work out to your advantage! Donâ€™t just throw out your old card! Remember, the number on your old card will be the number on your new card. So you do not just want to throw out your old card, because unfortunately, someone could take it. Then they will have your card number, which is definitely not good. They could then run charges on your account. So what you want to do is cut it up into small pieces, so it cannot be put back together. I hate to make you paranoid, but better safe then sorry!